It is hard to picture yourself on the fence when it comes to issues of wildlife conservation and hunting for sport. The two seem mutually exclusive, and advocates for each could hardly be blamed for believing they could never see the other side's point of view. Which makes the heart-churning new documentary "Trophy" eye-opening, depressing and enlightening all at once. It shows how these issues are inextricably intertwined, because of both the costs of preserving species that face extinction, and the profit motives of the multi-billion-dollar global hunting industry whose clients will pay big bucks to bag a prized specimen of lion, elephant, rhino or other magnificent creature. But there are people in the middle, trying to find a way to protect species in an imperfect, capitalist world where, for example, bans on the sale of rhino horn (enacted to protect rhinos from poachers) have actually increased poaching, decimating the species in just a few years. "Trophy" (which had its world premiere earlier this year at the Sundance Film Festival) follows several figures pursuing their personal goals involving animals, including: Philip Glass, a Texas rancher who is closing in on fulfilling a hunter's "Big Five," if the lion's recent addition to the endangered species list doesn't trip him up first; John Hume, a former property developer who has invested millions to raise rhinos and harvest their horns, to keep the animals from being slaughtered by poachers; Christo Gomes, who breeds exotic animals on his South African ranch, appealing to the tastes of his wealthy hunter clients; and Chris Moore, a Zimbabwean wildlife officer who must act like King Solomon among the local community whose livestock and family members are preyed upon by wild animals. If you think you know these people by these brief descriptions, you are wrong. Moore uses harsh "scared straight" tactics against the children of suspected poachers in the dead of night; Gomes cries when thinking about the animals he raises, only to be killed by the clients who pay his bills; Hume goes to court, fighting to repeal South Africa's ban on rhino horn sales and avoid financial ruin; and Glass visibly mourns the passing of an elephant, which takes a long, long time to expire from the bullets he has fired into its body. Director Shaul Schwarz and co-director Christina Clusiau do not pull their punches when showing the glee with which a beer-swigging hunter slaughters an alligator dragged out of its pond. "It's party time!" he says after firing his rifle at point-blank range. Nor with the Youtube commenter upset over Cecil's death, who happens to be wearing a leopard print scarf. As each person rationalizes their thinking and behavior for the camera, we are left questioning our own moral compass, and where animals fall within it. One of the most moving sentiments is from a taxidermist, Travis Courtney, who rues that the destruction of habitat forces animals into contact with people. "They always come second," he says, putting the finishing touches on a stuffed lion. "This might do justice to them," he says of his handiwork. "At least that is what I aim for. So if they do become extinct one day, it's something to show the world what they look like." Exceptionally well-photographed, "Trophy" captures the haunting beauty of these threatened animals, whether roaming free in a park beset by poachers or behind chain-link fences, oblivious to the safari that awaits. 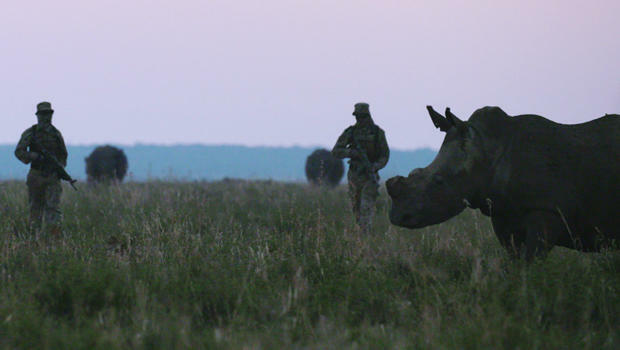 The film, strangely, inspires something close to hope -- despite the poaching statistics and depressing bloodlust -- because, as evoked by the film's participants in so many different ways, the value of these animals is calculated far beyond mere currency, despite the monetary impulses on view. As anti-poaching activist John Hume observes about harvesting rhino horns rather than slaughtering the animals outright, "Who would kill the hen that lays the golden egg?" "Trophy" (distributed by The Orchard) opens in New York City and Santa Monica, Calif., on Friday, September 8, and in cities nationwide beginning September 20. (Get tickets.) The film will be broadcast on CNN in 2018. 109 mins. This film is not rated. To watch a trailer for "Trophy" click on the video player below.